These comfortable guestrooms are ideal for business travelers thanks to amenities like high speed Internet access and a convenient work desk. You'll also find excellent services and beautiful views of the golf course from your balcony. 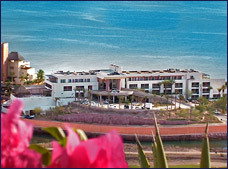 These comfortable accommodations are designed to provide maximum comfort during your stay in Baja California. They are equipped with several indispensable amenities for your convenience. These comfortable rooms are designed to offer you a memorable stay surrounded by a variety of great amenities. Relax with charming ocean views from your balcony.